First, however, it’s important to clear up any fuzziness attached to the term “grammatical.” Don’t let yourself be intimidated by the word: there is nothing mysterious about it. When we say that a sentence is grammatical (or grammatically correct), we just mean that all its parts obey a set of rules that control how different parts of speech (nouns, verbs, etc.) fit together. If you learn these rules, all the guesswork is taken out of the process. In fact, you are probably already familiar with most of them. It is just a matter of getting clear on the basic terms and ideas that will help you apply them in context. For this reason, students (in my experience) often find that their quickest gains come in the Writing and Language section as they master the process of translating their “unconscious” knowledge of English into the conscious rules that will aid them on the SAT. 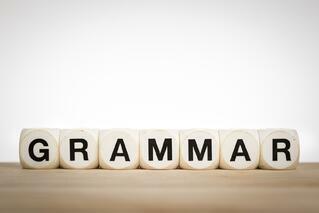 OK, so you know that for a sentence to be grammatical just means that it obeys a set of rules. But you might still be worried that, implicit grammar of knowledge aside, there will be a bewildering variety of rules for you to learn in order to cover all of the different situations. In fact, there are only a very limited number of concepts that can be used to describe and explain almost any sentence. This means that with sound knowledge of some of the basic principles, you should be in a good position to generalize to almost any new situation. Your goal, then, is to familiarize yourself with this limited body of principles before you sit for the SAT. If you can manage to do that, the test will hold no surprises for you. While we do not have space to go through all of them here, we will try to get a sense of what they are like by examining a bit more closely one important rule, grammatical agreement. When we talk about grammatical “agreement,” we mean the fit or match between different words in a sentence that indicate that these words go together. In practice, this means that we change the endings or forms of words in order to indicate that they refer to something in common. Some languages require that nearly every word be changed in order to show its grammatical relationships with other parts of the sentence. This has consequences for grammatical agreement. In Latin, for example, adjectives must “agree” with the nouns that they modify in three things: number, gender, and case. The endings of the adjectives must be changed in order to achieve this agreement, like boni viri (“the good men”). Even if you don’t know Latin, you will notice that both words end in i, which shows that they go together here. As the example of nouns and adjectives may hint, English is not bound by many of the most challenging kinds of agreement that are required in other languages. There are still two important relationships you must look out for, however: subject-verb agreement and pronoun-antecedent agreement. Subject-verb agreement is a good place to start. Every sentence will have at least one verb. This verb needs to agree with its subject (the person or thing doing or receiving the action). In English, a verb must agree with the noun in both number and person. “Number” is singular or plural. “Person” is first-person (I, we), second-person (you, you all), or third-person (he, she, it, they). In practice, the only errors in agreement likely to trip you up on the SAT are the third-person singular and plural cases—“we am,” “you is,” etc., just sound too funny to the ear to pose any real problems. For third-person cases, remember that a singular verb will always end in -s; everything else is plural. Still, you’re not likely to be thrown by a sentence like, “The dog run and jump.” The error is too obvious. But the test has a variety of ways to make things more difficult. Here are two things to look out for. Can you spot the error? The second “are” (plural) should be “is” (singular), because the subject is actually the box, which is singular. The sentence is made more difficult by inserting a relative clause (“which are useful”) that has “tools” (plural) as the subject, and by adding various plural nouns in order to supply detail (“tools,” “appliances”) which might make the second “are” sound correct. Challenging pronouns that are singular, but often look or sound plural to our ears. Examples include: each, every, any, everyone, everything, anybody, anything, none, no one, nothing, somebody, someone, something. Whenever you see one of these pronouns modifying the subject (or itself the subject), check whether the verb is singular. Pronoun-antecedent agreement is similar to subject-verb agreement in that the most important thing to look out for is determining whether there is agreement in number. Pronouns are nouns like “it,” “he,” “she,” or “they,” that is, nouns that stand in for another nouns. (The word pro- means “in place of,” if that helps you remember what a pronoun is.) The term can also more broadly designative possessive adjectives like “his,” “her(s),” “their(s),” “its,” and so on. By definition, every pronoun has an antecedent, that is, something it is standing in for. Here is an example: “The dogs went to the park. They made a ruckus there.” They is the pronoun, and it stands in for dogs. Therefore, the antecedent of they is dogs. Pronouns must always match their antecedents in number and, when appropriate, gender. The latter category will ordinarily not pose much difficulty. Matching the number of pronouns and antecedents, however, can be made difficult by the exact same tricks that make spotting subject-verb agreement. In particular, you will need to watch out for antecedents that sound plural, but are really singular. “Their” should be “its,” because we are referring to a company, which is a single entity. As a collective, a company requires a singular (not plural) pronoun standing in for it. The same is true for teams, organizations, enterprises, and other collectives. “Their” should be “his” because its antecedent, every guy, is singular and masculine. Also, the soccer team does not have one giant uniform (singular) that it is collectively washing. Your tutor will be able to go over other tough cases of agreement with you and fill in the details of this short sketch, but the basic rules regarding agreement should now be clear. Once you have determined which parts of the sentence should be in agreement (subject and verb, pronoun and antecedent), you only need to ask yourself whether each of these parts shows same number and, as applicable, person or gender as the other. From this case study, it should now also be clear how, as I claimed earlier, only a limited number of grammatical concepts are sufficient to explain most sentences you will meet. As we have seen, getting clear on the notion of “agreement” lets you test the fit between subjects and verbs, nouns and pronouns, not just in a few sentences, but everywhere that they show up. Interested in learning more about our incredible team of SAT tutors? Interested in reading more on our SAT preparation?